2013 is coming to an end! I have been reflecting on my art journey over the holidays and realize that I have come a long way since January. At times it seemed as if I was going backwards. However looking back with hindsight those blips were necessary for progress! My word for this year was focus. It seemed as if I had lost focus in the second half. But as always when you have a period of intense progress there is a time that is needed to absorb the changes. The ICAD challenge was a major breakthrough for me. I discovered that I like whimsy, watercolours and acrylics. It has taken me a time to let go of painting in oils. (I have developed allergies with the oil paint and I don’t have space to leave oils to dry etc. etc.) But, knowing me probably an odd oil painting or two will creep in. I have fallen in love with watercolours and gouache again. I don’t know where 2014 will take me but I know it will be exciting and surprising. I have signed up for a challenge in January over at Leslie Saeta’s 30 paintings in January! Yep, I am crazy! I intend to do small acrylics on boards, of whimsy, flowers and whatever. I probably won’t post every day, maybe every other day or so. 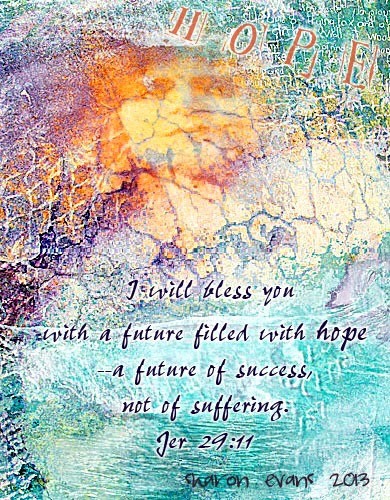 The digital piece I did earlier in the year I think says what I wish for me and all of my bloggie creative friends at Paint PartyFriday. Impressive...beautiful recap and I love your whimsy work!! I think we had the same word Focus and I was pretty much the same as you....half way I took a different path!! I really feel you have evolved and found your true style.... Love it!! I treasure the pieces of yours that I have!! I think your art is amazing and I love seeing so much of it on the one post here. And thanks too for the link on the 30 paintings. What a fabulous idea. I've joined in too! A great recap of beautiful art! There's nothing better than looking forward to the new year with hope! Happy PPF! Sharon, all your works are just gorgeous. I especially love the Jeremiah one. Lovely colourful work. Best wishes for the New Year Sharon! Dear Sharon, your post is really amazing. Wonderful thoughts and reflections and you let us be a part of this, of your progress. Have a wonderful start in the New Year! If You're learning and creating, you are moving forward. Thanks for sharing your thoughts and goals. Have a creative New Year! Beautiful work Sharon. Wishing you a Happy New Year in 2014! Yay! Hello Sharon, You had a productive and colorful year. You are brave to take on new challenges and stretch in areas new to you. I look forward to seeing more of your creations in the the upcoming New Year. Wishing you many more creative times! I love your colorful art spanning from happy to thoughtful and your very own style! Thank you for sharing the past year and your thoughts on your blog and for the beautiful and hopeful art and wishes for the new year!